Successful weight loss involves the synergy of multiple body processes, like metabolism and energy utilisation. Additionally, the act of losing weight can tax the body, resulting in a reduced feeling of wellness, such as sluggishness, tiredness, and irritability. Certain herbs work with the body to maximise these processes for effective weight loss, maximum energy, and a general feeling of well-being. 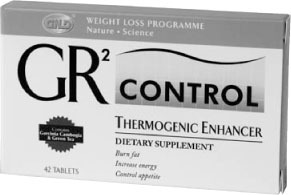 GNLD’s Thermogenic Enhancer is an effective blend of seven herbs to support your body’s natural metabolic process of energy utilisation without the use of potentially harmful stimulants. Why Choose Herbs for Weight Loss? Herbs are nature’s solutions to wellness and weight loss challenges. Herbs work naturally and gently to support the body’s natural metabolic process of energy utilisation. Herbs have been shown to restore the body’s balance and help the body perform at its vital best. Herbs have been shown to enhance energy levels and increase the body’s metabolic rate. 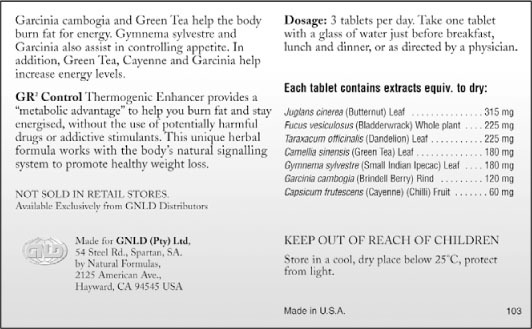 Why GNLD GR² Control Thermogenic Enhancer? Comprehensive formula. Our unique “complete family”	formulation provides broad, synergistic effects of the herbal constituents, which optimises their ability to support successful weight loss. Contains Brindell Berry, which has been shown to help stabilise appetite and inhibit lipid and cholesterol synthesis. Contains Green Tea and Cayenne, which have been shown to increase energy utilisation. (Garcinia cambogia) Promotes appetite stability. Helps inhibit lipid and cholesterol synthesis. Supports thermogenesis. (Asclepiadiaceae) Promotes healthy insulin and blood glucose levels. Stabilises appetite. Reduces fluid retention. (Fucus vesiculosus) Loosens bowels and gently eases constipation. Supports weight reduction and promotes satiety. (Taraxacum officienale) Reduces fluid retention and helps eliminate waste and toxins from the body. (Centella asiatica) Stimulates the body’s natural fat-burning mechanism. (Juglans cinerea) Supports optimum liver function. Facilitates the elimination of waste products and toxins from the body. Stimulates digestive tract and associated glands. Promotes metabolic activities, including mobilisation of body fat. (Capsicum frutescens) Stimulates body metabolism. Promotes feelings of well-being.